Get the perfect gift for the traveller in your life. – Always Carry On. Get the perfect gift for the traveller in your life. With less than a month until the big day, the high streets of London have been taken over by thousands of Christmas-crazed shoppers, all looking for the perfect present for their other half/parent/child/sibling/milkman/cat (no judgement, please). I’m really not a fan of shopping at the best of times, but I particularly hate this time of year – so tend to do my Christmas shopping online, from the comfort of my living room, with my pyjamas and slippers on, most probably while watching EastEnders or a crappy Christmas film, with a cat on my lap (again, no judgement). “The gift of travel”? I actually laughed out loud when I read this. Just a month after the budget airline announced that it was cancelling flights for more than 400,000 passengers over the coming months, Ryanair is now trying to sell gift vouchers for flights. Perhaps it’s an attempt to try to claw back the clientele it’s lost to rival low-cost airlines like EasyJet, Norwegian Air and Wizz Air, but to me it’s just another insult to those that have been affected by the Irish firm’s HR plunder, and whose travel plans are now all up in the air (though not literally, obviously). After all the recent Ryanair flight cancellations and the issues I’ve faced with the Irish company, I wouldn’t give a Ryanair gift voucher to my worst enemy. But this got me thinking: what is the perfect pressie for a traveller (e.g., what would I really love for Christmas)? 1. Some more Traveller Collective rings. First up on my list, some new rings for my Traveller Collective keychain. For my 30th birthday (and to celebrate completing my 30 before 30 travel challenge), my best friend TJ got me the most thoughtful present: a Traveller Collective keychain with an engraved ring for every country I’ve been to. Only available online, the Traveller Collective company offers a range of products, including necklaces and keychain fobs. Each one can be personalised with rings that are engraved with either two or three letters (the three-letter ones are slightly more expensive). The keychain fob is available in three colours (I received the “tan” one from TJ, which is more of a baby pink colour), so it would make a great gift for both male and female travellers. However, note that the fob is made of 100% leather, so not suitable for vegans. Good news though, there is a vegan-friendly version available – the leather is artificial and slightly thinner than the other fobs, but still does the same job. The company consists of Jess, Darryl and Graham; a trio of travellers who founded Traveller Collective with the aim of giving back to the countries that need financial help the most. You can read all about their story over on the site TravellerCollective.com. All the products are handmade in Vancouver, and can be shipped all over the globe. Since turning 30 in July earlier this year I’ve been to the Dominican Republic – and by the time Christmas Day rolls around, I’ll have been to Iceland too. So that’s two new rings needed for my keychain Santa, and you’ll be helping a good cause too. 2. A Kate Spade passport cover. Did you know, that wherever I go – even if entering a European country – I always ask for a passport stamp? The way I see it, a passport stamp is the only souvenir you can take back with you that’s “free”. Because of this though, my passport has certainly taken a bit of a battering over the last couple of years, and now has over 20 sets of stamps in it. So what I really want, no need, is a passport cover to keep it from getting even more worn. I absolutely adore this Piñata cover from Kate Spade, in fact I love anything Kate Spade. I fell in love with designer when I went to New York back in January 2015, on my first solo travel trip. I spent well over an hour in the store on Fifth Avenue, coming out with a beautiful pair of stud bow earrings and a dainty rose gold key bracelet. Unfortunately this passport cover is old season now (so the only place to pick one up is eBay, if you’re listening Santa? ), but some of the new season designs are just as cute – especially the flamingo and bulldog covers. 3. A personalised Always Carry On sun hat. I love personalised stuff; ever since I was about six years old and wore a fuzzy velvet headband with the letters “R E B E C C A” written in glitter glue across it. After that came a personalised pencil case, which soon had the R and the first E scribbled out, as I became known as Becca when I was about eight or nine. And then I used my pocket money to get a personalised England football shirt (the 1998 home shirt, in case your curious), because I was a bit tomboy-ish when I was 10. Fast-forward 20 years, and though the Becca football shirts and pencil cases are long gone, I do have a personalised licence plate on my car (yep, I’m one of those). But I can’t really take that on my travels – unless it’s a UK road trip, of which my lime green Peugeot has been on a few. 4. A swan Big Mouth pool float. Ok, so I already have the giant pink flamingo float, which recently made a guest appearance in one of the VIP pools at the 5 star LHVC resort in Puerto Plata. But I could definitely do with the swan too. And maybe the donut, and the unicorn, perhaps also the weird avocado shaped float… Heck, all the Big Mouth pool floaties would be welcome. And a little portable electric pump that works properly would be good too (the one mum and I brought with us to the Dominican Republic took ages to blow up the flamingo). They’re available from ASOS, just in case. 5. A flight neck pillow. Do I really want to join the group of travellers that has one of these weird half donut things fastened to their carry on luggage when boarding a long haul flight? I’m not sure – I’ve never tried a neck pillow, but part of me wants to. When mum and I were recently at Heathrow waiting to board our recent flight to the Dominican Republic, we very nearly bought a couple (two for £20 at WHSmiths), but I just couldn’t bring myself to do it. Perhaps if someone bought me one for Christmas it wouldn’t be so bad – that way, when I’m walking around the airport with it, or sitting with it around my neck on the plane, I could simply shrug and say “it was a present” to any fellow passengers who look at me the way I currently look at people with half a donut around their neck (e.g., with equal measures of “ooh they look comfy, wish I had one of those neck thingys” and “ha, that guy with the neck thingy looks like such a dork”). Oh, and I’d like one with a vintage map design please – thanks very much. 7. World map wall art. I’ll be moving into my new house soon – a Victorian mid-terrace property in the centre of Reading. As all my furniture and white goods are still in my flat (which is rented out), I’m going to have to buy everything again, from sofas and dining room tables, to beds and a fridge-freezer (really want a retro Smeg one, but have you seen the price!?). All these things come at a cost though, which will probably mean a (hopefully only brief) hiatus from travelling in 2018, unfortunately. But that doesn’t mean I can’t plan for the future and continue to add new countries and experiences to my bucket list. And in the meantime, I’d love to kit my new house out in items that reflect my personality and sense of wanderlust. This includes this piece of fabulous metal wall art from Turkish decor designer Hoagard. I just know it’ll look right at home on the wall in my new living room. Available in matte black, white, silver, copper or gold, and in two different sizes, it would be perfect in any travellers abode, actually. 8. Some vintage map sofa cushions. Continuing with the interior design travel gifts, I’m going to need some comfy cushions on my new sofa (when I get one). Most of my blog posts are written when I’m sat at home, curled up with my laptop (and a few cats) on the sofa; so what better way to inspire my wanderlust than being surrounded my maps and travel-related decor? I love these vintage-style map cushions that I spied on Instagram, though no idea where they’re from – I’m sure Father Christmas will know though, wink wink. 9. A Cabin Zero carry on backpack. As my blog title suggests, I always take carry on luggage wherever I go – or at least try to, anyway. I’ve managed five days in Jordan, a week in Cyprus and 10 days in Norway and New York with just hand luggage, though obviously not all in one trip. I usually take just a big, over-sized handbag, packing as light as possible. This is fine for trips to hot countries in the summer, as all you really need is a towel and a bikini. But it’s proving a little trickier for my upcoming trip to Iceland, as I try to pack for -4c temperatures with lots of thick knitted jumpers (plus a bikini for the Blue Lagoon). That’s why I need a good carry-on bag, that’s big enough for everything but still within the airline’s size restrictions for hand luggage. That’s why I need a Cabin Zero bag please lovely people buying me Christmas gifts. Preferably one in this cool blue and pink design, but y’know, I’m not fussy. 10. A beautiful beach blanket. Whether it’s a picnic on Bournemouth beach with my besties or a lazy afternoon spent sipping ice-cold Michaeladas in Mexico, I love lounging around on the beach. But what could possibly make any beach trip better? One of these big, beautiful blankets of course. I found this mandala printed one on The Fox and The Mermaid’s Etsy shop, and it’s just £21.56. What’s more, it’s versatile and can double up as a towel, a yoga mat (not that I do any yoga mind), a sarong, a shawl, even a throw on your bed. I need one. 11. The perfect beach bag. Along with the perfect beach blanket, I’d love the perfect beach bag, so that I can carry all my beach necessities (sun tan lotions, towel/beach blanket, book, sunnies, puzzle book and, of course, my phone) in style. I’ve mentioned already how much I like Kate Spade, so when I spied this beach bag over on Instagram, I knew I had to have it. Again, it’s from an old season though, so Father Christmas may have to scour eBay for a bit to find one. always listen to your handbag. 12. A new lucky travel charm. 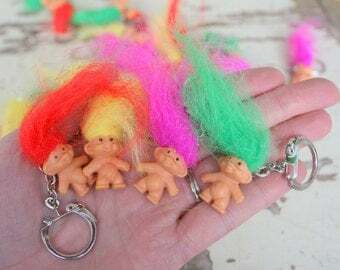 When my friend and I were 14 and going on holiday together for the first time, we bought ourselves matching Good Luck Troll key rings – not the new cartoon kind that dance to Justin Timberlake’s squeaky voice, but the proper, real Trolls (which are now described as “vintage”, because I’m that old). Anyway, we attached our Trolls to our suitcases before the holiday, to bring us luck on the trip. We called them our “Travel Trolls”, and over the years of holidays together, and then holidays with our respective partners, after returning we’d always enquire how Travel Troll enjoyed the trip. Sad I know, but it was our little joke. I don’t know whether Travel Troll actually ever brought me any luck when overseas, but he travelled on my case for another 16 years – sadly longer than the friendship with this girl lasted. However, in June earlier this year, as my battered pink case bumped onto the luggage conveyor belt at Cancun airport, I immediately noticed that something was wrong: Travel Troll was gone. Even before I collected my case, I could see there was no flash of purple fluffy hair where it should be, fastened to the zipper. I was tempted to ask the airport staff to see if they could find him on the floor of the plane, as I was a bit emotional, I won’t lie. But I sucked it up and walked away from the conveyor belt, Troll-less. And so, the final thing on my Christmas wish list this year is a new lucky travel charm. I know that Travel Troll is irreplaceable, because we shared so many adventures together. But it’s time to get a new travel charm that can continue my journey, into 2018 and beyond. Can we just skip to the part… ✈️🌎 . . Thanks to @airport_tag for hooking me up with some amazing travel gear. Check out their page and the link in their bio for awesome travel inspired products!! There you have it, my list of travel-inspired pressies that I’d love to find under the tree this year, and I’m pretty sure other travellers will want them to. If you’re a traveller, what else are you asking for this Christmas? Let me know by dropping a comment below, and Merry Christmas everyone! *smdh* Holy crow.that takes some cojones to screw over your passengers and then come back with this weak mess. I wonder just how much business Ryanair actually lost. And I’m with you on getting gifts for the cheetah,I actually prefer that he gets the goodies instead of me. I’m the traveller in my life I have to say. I particularly like the passport cover, it looks brilliant! I’ll try Ryan Air this December. I hope they will not cancel my flight! The selection of gifts is nice, but i would still go for flight vouchers and holidays. I think that what happened with Ryanair was a one time only thing and it won’t happen again, O’Leary will make sure of it. I actually support them because they make my life easier by flying from my home town to my other home town, and I don’t need to spend a fortune going to London for it. I know it’s everyone’s personal opinion and choice, but I will continue flying with them (and yes, they did cancel one of my flights as well but the compensation and the free flight they offered were actually better than the original option). Great ideas! My parents travel a lot and I was wondering what I could get them to do with travel. Flight neck pillows are so practical but also that one is pretty funky! These are really great gift ideas for those who like to travel so much. I am going to have to get some of these things as I know a few on my list that love to travel. I LOVE LOVE LOVE the world map stuff. The neck pillow is really cute. I know a few people that would love this. OH I wish I had more time and money to travel! Absolutely love that world map wall art – what a unique way to display your holiday snaps. Great idea for a gift guide too, definitely some stuff here I could pick up for my traveler friends. I started reading your post, and my first thought was “You didn’t did you”? Am so so glad you did not go for the horrendous offer from Liar Air. Instead I find a wonderful list of lovely ideas that are just perfect for Christmas presents. That passport cover is the cutest thing ever! I so need that in my world! Although my passport could use a few more stamps in 2018! I absolutely love that you decide to make your own listbof these great ideas for Christmas gift. I already have 3 minute mind. You save me time and energy, great post! First off, I love the alternative title to your blog post, haha, now we know what to get you! I love that metal world piece of art, it’d fit in nicely in my home! I also wouldn’t say no to a Kate Spade passport cover, just stunning! The neck pillow is perfect. I find it useful on a long bus ride too. I have so many friends that would love these gifts! They travel several times a year! I personally love the Kate Spade Passport Holder, That is so cute! Love your suggestions- there are some really unique gifts here. I think the giant pink flamingo float looks fun. I’m like you, I tend to do my Christmas shopping online too. I just can’t face the crowds in London! The Traveller Collective key chain is great present – a reminder of the countries you’ve visited. The metal wall art looks so cool, but I don’t think my husband would let me put it up! These are great gift ideas! Great gifting ideas 🙂 Personally, I loved the neck pillow and the wall design on the list. Oh my i love all your suggestion! I love the kate Spade passport cover, and the wall art is just so amazing and so unique. Oh so many wonderful gifts. If only I could convince the inlaws to read this guide and actually buy me something good for once. Nice list of some unique ideas. I like how you referenced items that travelers are actually using as seen on Instagram! I am in love with the Kate Spade Passport Cover, it is beautiful! The items in this list are not just useful but super stylish! Same to me! I don’t like this craziness all around and I order all presents online – in my pajamas 😉 still have a few people to make a present, so thanks for these picks! I am going to be totally honest. When I first opened up this post I rolled my eyes and thought (from the perspective of another travel blogger) “not another ‘gift ideas’ for travelers post” – but then I fished through your page, and I legitimately LOVE everything you posted. You didn’t post the same products I keep seeing over and over again. I think I need that Kate Spade passport holder in my life…. Great gifting ideas…I love everything you suggested here. Passport Cover, neck pillow, and the wall design are amazing things.. The actual cheek of Ryan Air! Although travel vouchers from a non crappy company would still be appreciated. I’m in love with that Llama passport case, Kate Spade always makes the cutest accessories. Good post. I saw the traveller collective key rings a few months ago and thought they were brilliant! These are some awesome gift ideas, I’m not very good at thinking of gifts for people who are off to explore the world so it is nice to have some ideas on hand. Great ideas. I love the photos! ← Why I’ll never fly with Ryanair again.